Grand Canyon Backpacking and Hiking! Wild Vistas Trekking offers an extraordinary selection of backpacking and hiking trips for groups. To ensure an intimate wilderness experience, all scheduled trips are limited to a maximum of 8 clients with no minimum (we guarantee our trips will go out even if only one person signs up). The following group trips are currently scheduled in the Grand Canyon. Guided hike from the South Rim to Phantom Ranch. 2 nights at Phantom Ranch. guided day hike at phantom Ranch and a guided return hike to the South Rim from Phantom Ranch. Explore the Grand Canyon as few will. Much of our route for this week long adventure is off trail and away from the crush of people. You can expect short sections of rock scrambling and rapelling. 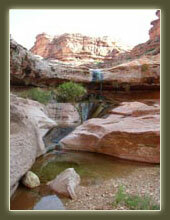 The trip is rated strenuous and is available by application only and is based out of St. George, Utah. Join us on this backcountry backpacking/ hiking adventure and enjoy the rewards of wilderness hiking. As we trek the Wildreness of the North Rim of Grand Canyon, we may hike along the rim, explore canyons, find streams springing from rocks. 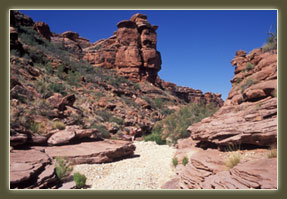 View rock formations, amazing colors, waterfalls and sheer canyon walls that most people never see. A hike down a beautiful U-shaped canyon, with opportunities to see fossils, Indian ruins and Indian art on the canyon walls. 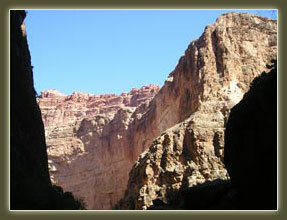 This is a trip into the Wilderness of the Grand Canyon, a place of amazing scenery and few people. 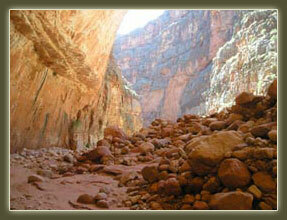 You will have opportunities to explore side canyons and enjoy the beauty and tranquility of redrock Canyon Country. Grand Canyon Backpacking! 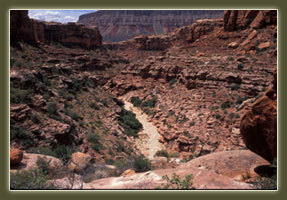 Few people take the opportunity to hike into the Grand Canyon through Kanab Creek on the canyon's North rim. 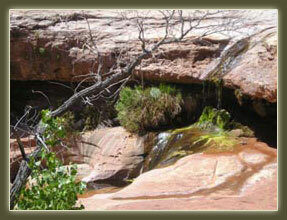 Kanab Creek offers some of the most spectacular canyon hiking around. As it approaches the Grand Canyon, Kanab Creek has carved a magnificent gorge of soaring red rock canyons. Just one of the many rewards of this trip is the view of the Grand Canyon, looking up, at the confluence of Kanab Creek and the mighty Colorado River. The trip is rated moderately strenuous and is based out of St. George, Utah. Sample the most spectacular hiking routes in the American Southwest with a series of Inn Based day hikes in Grand Canyon and Zion National Park. The trip is rated moderate and is based from St. George, Utah and transportation is provided to and from the Grand Canyon from there. Over 3 million people visit the Grand Canyon each year and most of the folks who explore the canyon, use several very busy trails. 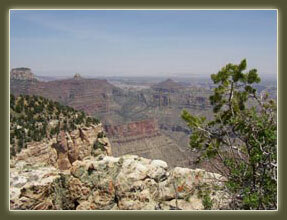 Join us for a backpacking exploration of the spectacular South Rim using quiet, little used trails. Our route takes us to the Colorado River and back with truly awesome vistas. Experience the wonder of the canyon rather than the bother. The trip is moderately strenuous (elevation gain and loss, uneven footing). One of the best kept secrets in the Grand Canyon is its spectacular fishing. Join a professional fly fishing guide on this spectacular mule supported hike and fishing adventure. We’ll transport you from your hotel in Phoenix to the North Rim of the Grand Canyon where we’ll enjoy dinner in a rustic lodge. After breakfast we’ll hike the North Kiabab trail to Cottonwood campground where we’ll set up camp and enjoy afternoon fishing. Day three will find us hiking to the Colorado River where we’ll set up camp and fish the afternoon in a spectacular setting. Day four is a layover day when we’ll hike, fish and relax. On our last day, we’ll check our equipment with the Mules and hike to the South Rim and a well deserved celebration. We’ll be transported back to our hotel in Phoenix. Few features in the Grand Canyon match the beauty of the aqua marine pools and water falls at Havasu Falls. The Havasupai Indians have cultivated this area for thousands of years. 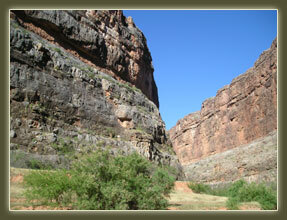 Join us as their guests for a 2 night 3 day hike or horseback ride into one of the true gems of the canyon. We’ll spend 2 nights at the lodge in the village and spend our days exploring the breathtaking falls and views of the Grand Canyon.